From March 16th through August 26th New Orleans Museum of Art hosts Puerto Rican-American artist Carlos Rolón’s exhibition Outside/In, exploring the rich connections between New Orleans, Latin America, and the Caribbean through allusions to each region's natural and built environments. A central component of this exhibition is Rolón’s Nomadic Habitat (Hustleman), a mobile cart inspired by the street vendors of New Orleans and the Caribbean that speaks to themes of class, commerce, immigration and survival. The cart is activated by local artist collectives and community partner organizations on select days throughout the run of the exhibition. The current incarnation of Nomadic Habitat (Hustleman) is organized by members of The Front, whose activation You Want a Piece of Me fills the cart with artworks that will be offered to museum visitors in exchange for their own personal effects and stories. Containing a raucous mixture of objects both sacred and profane, the project speaks to the role of desire, mysticism and sacrifice at the heart of artistic exchange. Ranging from exquisite crystalline sculptures filled with drops of the artist’s blood, to performances that invite museum visitors to engage directly with the artists themselves,You Want a Piece of Me presents a series of talismanic art objects that ask how much of the artist remains in the artworks we purchase and visually consume. 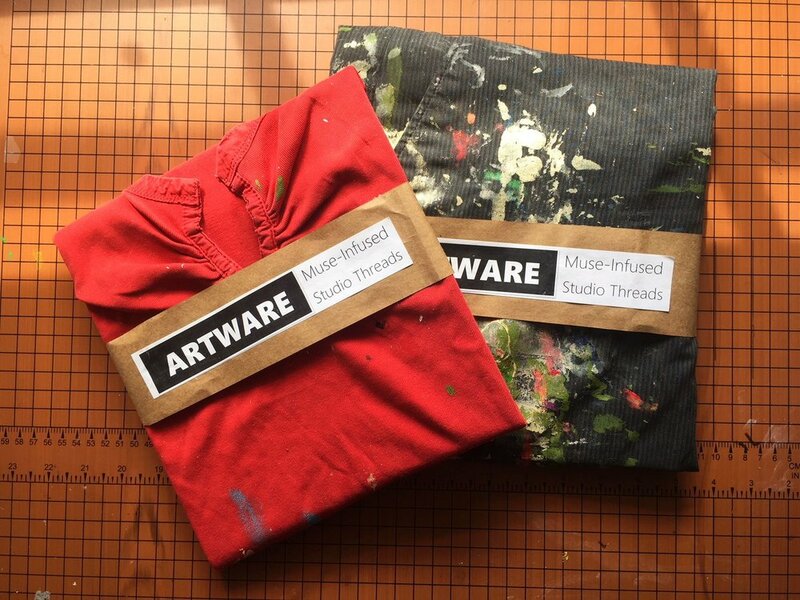 Like Sir Elton John's glasses or Ryan Sandburg's jersey, these pre-worn studio clothing items were there WHEN IT HAPPENED and are 100% Muse-Infused for your creative fortune. Exchange for a lucky item of your own (such as those socks you wear on game day for a Saints win, or those lucky interview earrings). Interested individuals without lucky apparel to exchange may instead draw a portrait on-site of a present cart vendor. Written or video recorded story of spiritual/magical/unexplained experience OR altar object. Altar Archive is a project in which artist Ryn Wilson offers a trio of objects imbued with intention: a used novena candle, precious stones, and tarot collages, and she asks for a sacred object or story in exchange. Stories of magical, unexplained, or spiritual experiences can be shared through writing or video recording. This collection of objects and experiences will later be displayed as a part of an upcoming exhibition. Pick one (no peeking first!) - it has the exact advice you need in this moment. Please write a piece of advice you've found useful on the clipboard below the display. Each Power Talisman conveys specific wisdom and support upon the person selecting it. Please trade a piece of jewelry imbued with your own presence for your talisman. The jewelry will become part of a collaborative art piece by The Front. A selfie with flower adorned on their body. White House Heros - Action Figures - Collect the Entire Administration! Any physical photograph in exchange. Knucklebones (game pieces for divination) urethane resin, artist’s blood, red velvet Series (x 5 sets) of cast resin finger bones displayed in red velvet bags or red velvet pentagonal mat. Knucklebones (game pieces for divination) explores games and game pieces – objects you toss, roll, and can carry in your pocket. They are playful but can also contain power and meaning. The sculptural form of cast human finger bones is inspired by an ancient game played with the ankle bones of sheep. Imagery and materials of the occult are also present here – the bones, the pentagon of red velvet, ideas of divination and fortune telling. Including an element of the artist’s body – the blood – is significant. The small crimson flakes suspended in the clear resin speak of mementos and religious relics, as well as expressing ideas of artistic production and sacrifice. The Knucklebones can be traded for. You are invited to trade me something you made with your own hands, something you formed and created with your labor, or you can trade a memento of a grandparent – something that speaks to your past and your bloodline. The bones do not contain the answers, but the patterns found in the bones might guide you toward the right questions. Shrunken Head Charm of Acceptance, Please trade for an object of equal value in your estimation. Bandana Patch Flags: Want a bandana? Let's make a deal. Something from your purse, pocket, an article of clothing, a trinket, a talisman, a totem -- take a piece of me and I'll take a piece of you. A proposal/promise by the viewer to do something good for someone else, an organization, volunteer, donation, etc., written on 2 part NCR paper. One copy goes to the artist and one copy stays with the viewer/ recipient of the piece. Bite mark sample from a participant on Laffy Taffy. I've got two large glass jars. One for unopened candy, one for bitten candy, each participant gets a keychain with my bite mark. Bite Me. Choose a piece of unopened candy from the jar, open it and leave a bite impression. Drop the masticated candy into the other jar. Take a keychain with the artists' own impression. "Forget Me Nots" - Plaster casts of my fingers w/ red “reminder” bows. Name, fingerprint, and what you want me to remember about you on provided card. In exchange for allowing the artist to blindfold you and take your photograph. Your Persona Rose (Masks of Being and Becoming). In some circles, the blindfold can signify a transition between two states, aiding its wearer to journey inward. By becoming introverted for a while, less energy is spent worrying about the outside world, and more on the magic that lies within. In exchange for one of these unique, hand-sewn items, visitors are asked to allow Robyn LeRoy-Evans to blindfold them, then photograph them whilst on a momentary journey inward.